A few months back, I popped by the Clarks SS14 presentation to have a look at the new propositions from the British brand for the upcoming season. Before I rave about my favourite styles, you must know that I am a shoe-junkie, more specifically, I am hooked to desert boots – you can't simply have enough. And it's precisely desert boots that Clarks have mastered through the years. My personal choices from the SS14 line are the brown Beeswax leather (1) and the suede Sand Multi (2), which will look great with your Spring light blue jeans, and the Wolf Suede (3) and the Denim suede (4) models – perfect with your beige, camel and khaki chinos. I am also loving their Desert London Beeswax (5), which is the perfect hybrid of dress and casual with an aged effect great for the new season. Something similar happens with the Fulham Limit (9), which combines a casual scalloped sole with the smart brogue detailing injecting a bit of fun with the contrast laces. 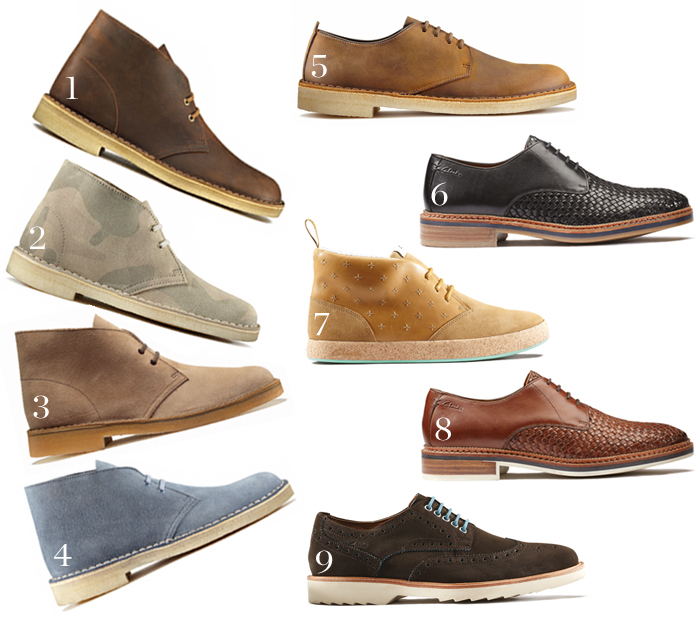 From their sportswear propositions my favourite is the Tanner Surf (7), which combines embroidered leather, suede and a cork sole to keep it comfortable and light. And finally, my absolute favourite style of the season – the Grimsby Craft (6 and 8) in tan leather and black. It has this vintage flair that reminds me of the Italian coast (think Jude Law in The Talented Mr Ripley). As the proud owner of a pair, I can say they are as well made as they are light and comfortable, which makes them the perfect multi-ocassion Spring shoe.